Today, when you order "The Indescribable Phenomenon by Barry Wiley (Anna Eva Fay Bio) - Book", you'll instantly be emailed a Penguin Magic gift certificate. You can spend it on anything you like at Penguin, just like cash. Just complete your order as normal, and within seconds you'll get an email with your gift certificate. This book was so awesome that it has sent me on a wild goose chase to hunt down a copy of another, now out of print, book by the same author. If you're at all interested in Victorian-era mediums; if the history of Mentalism, including the Q&A act, is your cup of tea; if you would like to know a lot of detail about the life and career of a remarkable performer who has been largely forgotten by history then BUY THIS BOOK BEFORE IT GOES OUT OF PRINT! Not only is this book extremely well put together and written, but Barry Wiley has gone to incredible lengths to source just about everything. The bibliography section in the appendix is HUGE and he often includes footnotes that span almost an entire page. This lends tremendously to the credibility of the information, and also provides a wonderful resource for further reading. 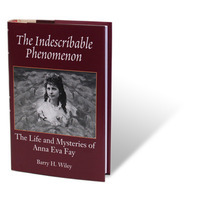 Not only is the life and career of Anna Eva Fey detailed throughout this book but it is also a history lesson on Victoria era spiritualism in general, which includes the most detailed biography and account of the Fox sisters (who are credited with starting the whole "spiritualism" thing) that I have yet to come across. While I generally prefer books over DVDs (because they usually give more bang for your buck), I still often find books about magic to be way over-priced. I mention this because this particular book is one of the few "expensive" books that I think is WELL worth the price. $65 is actually just about perfect given given the rarity of the information contained and the extraordinary lengths the author went to gather and source the information contained. With that said, don't buy this book if you're looking for tricks or methods. Some are contained, but it is not the point of the book. This book is a biography and a history lesson on Victorian era mentalism and spiritualism, particularly the career of Anna Eva Fey. That should be obvious by the description. If that's what you're looking for then buy this book immediately. If you're looking for a book on tricks or routines then there are richer resources for that.